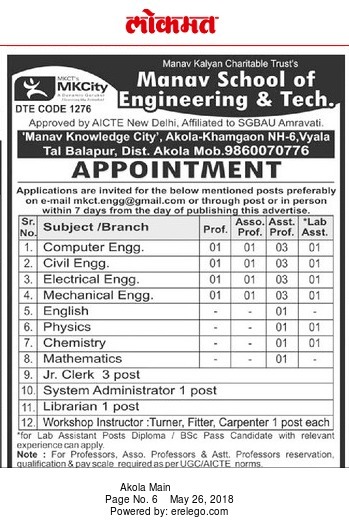 Manav School of Engineering and Technology, Akola has advertised in Lokmat newspaper for the recruitment of Professor/Associate Professor/Assistant Professor jobs vacancies. Interested and eligible job aspirants are requested to apply with in 7 days. Check out further more details below. About College: We aim to provide an opportunity to the young generation for exploring their core competencies for starting their career with professionals in depth knowledge & versatile personality to meet the challenges of global economy .